It's 6:58pm on Saturday, April 16th. I'm reading on my computer at my desk in the office. Marilyn is working on her computer at her desk in the office. My desk starts to shake and my wheelchair starts shaking side to side as if I'm in a baby's rocking cradle. Only, my chair's not tilting, thank God. Marilyn's experiencing much the same. Marilyn looks at me and I look at her, both sets of eyes wide. The Nazca Tectonic Plate has just moved again, on its inexorable dive beneath the South American Tectonic Plate. We find out later that this causes a magnitude 7.8 earthquake. We run to the back door to get out of the house, but Marilyn has to get the keys from the bedroom because she's already locked up for the night. Just then, the lights go out. While she's finding the keys in the dark, I'm sitting in the kitchen still swaying. I hear and see the back door rattling in its frame. This makes me keep my eye on the kitchen ceiling, watching for cracks. It seems a lifetime before she finds the keys to unlock the multiple locks on the back door. Finally, the door is open and Marilyn and I waste no time in getting outside. Neither does Canela, our dog. I'm not sure if she wants to get out of perceived danger or simply join the chorus of barking neighborhood dogs. Later, we notice that she's jittery throughout the night, so we assume she got out because of her intelligence rather than her sociability. Isabel and Brayan are in Quito this weekend, so we're on our own. We go down to the end of the driveway, past the house. We feel pretty safe here because the nearest part of the house is only one story tall. We are near a corner of our property, where two 6-8 ft. high cinder block walls meet. But we feel that, if any of these structures shows signs of collapsing, we'll have time and space to get out of the way. By the time we've stood at the bottom of the driveway for a few seconds, the world seems stable again, the earth solid once more. Total elapsed time: FOREVER (about 4 minutes). For us, it's over, though that's definitely not the case 200 kilometers or so west of us. We wait a few minutes to see if there are any aftershocks (though we know they can occur at any time during the next few days or weeks) and then go back inside. It's hard to find our portable sources of light, and then replace the dead batteries, but Marilyn manages. We also resort to a couple of candles on wide saucers. Cesar, Isabel's brother, calls to check on us to see if we're okay and we really appreciate it. Neither Isabel nor Blanca can get through to check. Either cellular service between here and Quito is disrupted or call volume is too heavy. We will talk with them, as well as other friends, tomorrow and in the days following. Marilyn takes a flashlight and does a walkthrough of the house looking for tell-tale signs of damage and doesn't find any. Neither did we see exterior cracks in the house when we were outside in the moonlight. We're thankful that the house appears to have been well-constructed. After using our computers on battery power for an hour or so, we decide to go to bed. I briefly think about staying in my chair all night due to the possibility of aftershocks but quickly discard that idea. Logically, the aftershocks won't be as strong as the initial earthquake. Ergo, if the initial earthquake didn't cause any detectable damage to the house, we should be okay. When we wake during the night to relieve ourselves, the lights are back on. We'll be busy the next day assuring family and friends that we're okay. This isn't our first rodeo, but we haven't been through this much shaking and swaying before. Almost surprisingly, neither of us are scared. That's because, after one about two years ago (which made the kitchen table come to life for about a minute), we have all talked about what to do. Of course, there is concern (hence, my watching the ceiling for cracks), but there is no panic. We're a little proud of ourselves actually - until we realize there are preparations that have yet to be made. 1. Hang a set of spare keys on wall near backdoor. 2. Only use one of the three key locks when we're home for rapid egress in case of earthquake or fire. 3. Check batteries, flashlights, and other portable light sources regularly. 4. Put together a "Grab 'N Go" kit containing clothes, medicines, important papers, a little money, and some food and water. Have it easily accessible. Check it regularly. As you no doubt know by now, the earthquake of April 16th devastated the northern coast of Ecuador. The death toll is now well over 600 and the number of missing is well above that. There are thousands injured, 10,000 to 30,000 homeless. The coastal towns have been flattened, the highways rendered all but impassable, thousands of buildings are lost or damaged beyond repair, businesses stand shuttered or don't stand at all, thousands of people (both poor and well-off) are now unemployed. A reconstruction estimate I heard was three billion dollars. This at a time when Ecuador's economy is already in the doldrums due to low oil prices. Ecuador urgently needs help to get through this so it can continue its 8- or 9-year streak of lifting people out of poverty. A week and a half before the earthquake struck, we had the good fortune to meet three people from Canada while we were in Baños. 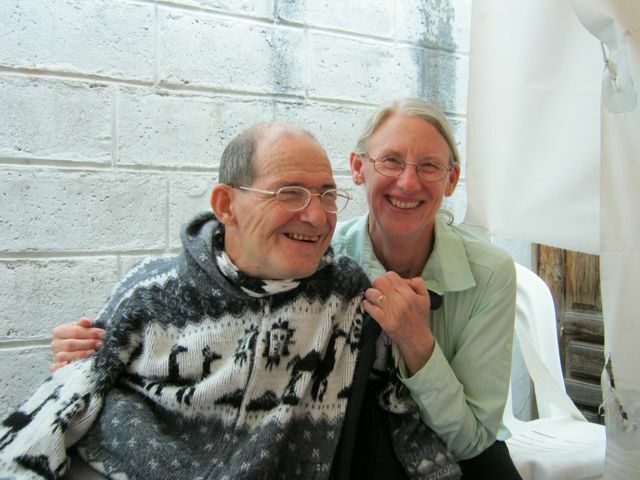 After visiting Otavalo, they went to the Galápagos Islands. One contacted us the day after the earthquake to check on us. He related that their alternative plan (if they couldn't get to the Galápagos) was to go to some coastal towns, including Canoa, which was reported as having been 90% destroyed. Some of their countrymen didn't have such a stroke of good fortune - they were found among the dead in collapsed hotels. We were at the grocery store the Monday after the earthquake and ran into some casual acquaintances. They are members of the Seventh Day Adventist Church in Otavalo and were buying supplies for a sister church on the coast. Friends of theirs had moved to the coast a month previously. The house they had moved to was destroyed. Fortunately, the congregation was at a service in the church, which did not fall down. So, most members do not have houses left but do have a place to shelter. Blanca told me the other day about a dog being rescued from a building. When it was pulled out, it promptly returned to the rubble. As the rescuers were sort of scratching their heads, the dog reappeared carrying a cat (alive) in its mouth. Isabel and Brayan, along with Patricia (Isabel's sister) were visiting a relative in a bar in downtown Quito. When the quake struck, Isabel thought she was dizzy from medicine she'd recently begun taking. She looked up, saw the lamps swaying, and they all ran outside. (She says it was the first time she's ever been in a discotheque - and the last.) It may have been worse outside because she looked up only to see surrounding highrises swaying and had no idea which way she'd go if they started to topple. Marilyn and I didn't have that problem to worry about. There have been over 400 aftershocks thus far, a few of magnitude 6.0 or greater. Neither Marilyn nor I have felt any, though Isabel and Brayan have felt a few. More buildings keep falling down on the coast. These aftershocks communicate that the earth is finding a new equilibrium at the boundary between two tectonic plates. This equilibrium will then hold - until forces somewhere in the Pacific Ocean force the Nazca Plate to take another dive beneath the South American Plate. These are only the stories I know personally. If I went to the coast, I could learn thousands more. Of course, there's no way I'd go. I'd just get in the way of the thousands of volunteers trying to help. I went to my dentist yesterday, who is a volunteer for Ecuador Red Cross (Cruz Roja Ecuatoriana). He's been organizing the Red Cross response from Imbabura, the province in which we live. He says that some volunteer groups are organized and others are very disorganized, mainly seeking publicity. I think that's probably the case the world over. Many people have asked how they can help, so I'm including some information here. In all three cases, please use the designation "FEDICE Earthquake Response". The following is a link to an article on Cuenca High Life listing various places where you can donate: https://www.cuencahighlife.com/help-earthquake-relief-effort/. Most are in Ecuador, but some are international organizations. I was probably wrong about the Nazca Tectonic Plate moving beneath the South American Plate, although that is the general motion. Instead, because there was no tsunami, the plates like "slipped by" each other at the boundary between them. Thank you, Glenn, for sharing your experiences and suggestions for "next time". I thought about you and Marilyn when I heard the news about the quake, and thankfully I am now assured that you knew how to take care of yourselves and made good choices. It seems like these natural disasters always come in bunches. I've heard from many friends in Houston. They say, "Are you okay?" I reply, "Are you okay?" Glad to hear that your high and dry, and that gg is a good gs! That one definitely caught my attention, alright. That 8.5 you went through must have been a doozy - even in Cuernavaca. I'm surprised there were no cracks! That is amazing given the construction materials. I've since found a few more cracks in the house. But they, like in the bodega, appear to only be plaster deep. This house was built 19 years ago. Maybe they used better techniques, despite the construction materials. We do know of a preschool near Lago San Pablo that suffered damage. However, you probably don't remember where that is, since we didn't take you.